Lens Description: This 800mm f/8.0 Mirror T-Mount Lens (Black) from Rokinon is a tremendous addition to your camera bag, opening up unimagined and powerful photographic possibilities. It\'s lightweight (33 oz/935.5g) and compact (just 5.68"/14.42 cm long) and it focuses as close as 11' (3.5m). The aperture is fixed at f/8.0. 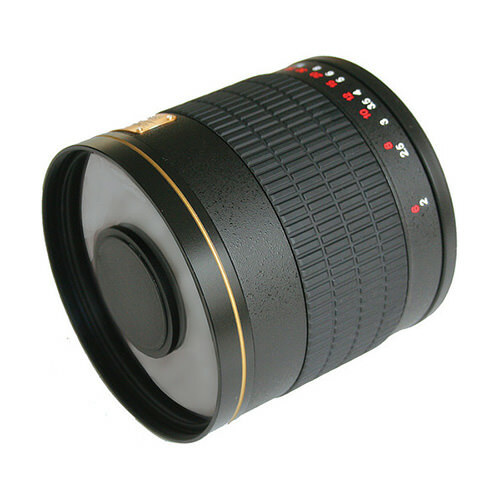 This manual focus lens is constructed from fully multi-coated low-dispersion optical glass, with a 105mm front filter thread. A T-ring adapter (available separately) is required to mount this lens to a camera body.